The Wittelsbach line of kings ruled in the independent southern German state of Bavaria for about a thousand years, up until around the time of the First World War. King Ludwig II, of the house of Wittelsbach, was born in August 1845 and became king at the age of eighteen upon the death of his father, King Maximilian II. The twenty-two-year reign of King Ludwig II (ending in 1886) was marked by controversy, intrigue, scandal and extravagance. King Ludwig II looked like a king. He was tall and handsome with dark hair and burning eyes. Upon ascending to the throne, he became a romantic hero to many and, in the intervening years, an object of ridicule and scorn to many others. He believed in his own absolute authority as king while despising the duties required of a king. He hated dealing with affairs of state; despised attending military reviews and other public gatherings that gave tens of thousands of people the chance to look at him. He became increasingly withdrawn from public life. His relationship with his mother, his brother Otto, and the rest of his family was strained. King Ludwig II believed in the romantic ideal of medieval Germany, an ideal that didn’t exist in his own time. He found the time in which he lived prosaic and uninteresting. He was steeped in the far-distant past, particularly in the French Bourbon kings (King Louis XVI and Marie Antoinette were particular favorites of his) and in medieval German legends surrounding Lohengrin, William Tell, and Tannhauser. The operas of composer Richard Wagner encapsulated for King Ludwig II the fantasy world that he longed for. He became the patron and champion of Wagner and, for a time, almost worshipped him. He believed that Wagner’s music was the nationalistic art that Germany longed for and needed. In addition to being a genius and innovator, Richard Wagner was also a greedy manipulator and a hypocrite. He used his power over King Ludwig II to get what he wanted. He was deeply in debt from the time before he knew the king and was always being hounded by creditors. He was always after the king to give him more money and the king, feeling about him the way he did, would never deny him. Any amount of money the king gave to Wagner was always followed by requests for larger amounts. Soon there was a public outcry over this extravagant partnership. Newspapers and politicians despised Wagner and called for his banishment from the country. The king’s relationship with Wagner severely undermined his effectiveness as king. While his friendship with Wagner tarnished Ludwig’s image as king, there were even bigger problems looming on the horizon. Bavaria was drawn into two wars that it—and its king—didn’t want. The wars further diminished Bavarian prestige and the Wittelsbach dynasty. As difficult as affairs of states were for Ludwig to deal with, his personal demons were, for him, even worse. As king of a Catholic country, he was guilt-ridden over his homosexual desires. He was engaged at one time to marry his cousin, Princess Sophie, but he called off the engagement before the wedding took place. He was known to have brief periods of infatuation for different young men, but they never lived up to his romantic ideals. As a result, he withdrew more and more into a fantasy world of his own making. This manifested itself in elaborate building projects. 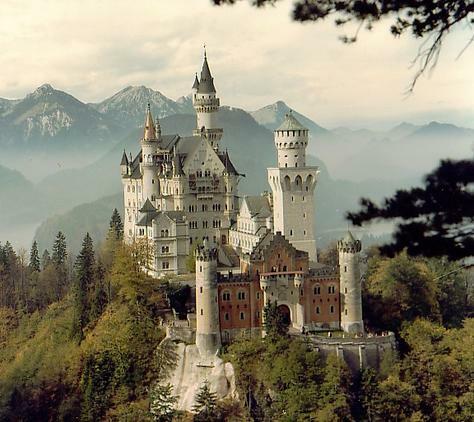 He built three fabulous castles at great expense, the most famous of which is Neuschwanstein Castle, built on a picturesque mountain peak in the Bavarian Alps. Ludwig lived in Neuschwanstein Castle for only one week. After his death it became one of the most popular tourist destinations in Europe, and it remains so to this day. King Ludwig II was called insane by his detractors and, to be sure, they had plenty of ammunition against him. There was believed to be a strain of insanity in his family, manifested especially by his brother Otto, who was kept virtually a prisoner from his early adulthood due to what was called insanity. In 1886, when Ludwig was forty years old, his uncle, his prime minister and other members of his government staged a coup to have him removed from power. Even though Ludwig and a small band of his followers resisted the coup, it was successful and Ludwig was no longer king. His insane brother, Otto, automatically became king in his place, but he was king in name only for the next thirty years, never even realizing he held that title. A regent was appointed to handle the actual duties of king. A few days after being deposed as King of Bavaria, Ludwig II died mysteriously in Lake Starnberg. On a rainy evening in June 1886, he was taking a walk with one of the doctors who had declared him insane. When Ludwig and the doctor failed to return at the usual time, a search was begun. The bodies of Ludwig and the doctor were both found in the lake. Nobody ever knew for sure exactly what happened, but there were plenty of theories, the most prevalent being that Ludwig murdered the doctor and then drowned himself. There was also a belief among those who refused to believe that their king would commit suicide that he scuffled with the doctor, subdued him, and then drowned as he was trying to swim to the other side of the lake, where a rescue party was supposedly waiting to take him to safety. In spite of his turbulent reign, King Ludwig II remained a much-loved figure up to the end of his life. He had an elaborate state funeral and was interred in a church in his capital city of Munich. For an engrossing and highly readable account of the life of King Ludwig II, read Greg King’s excellent biography, The Mad King: The Life and Times and Ludwig II of Bavaria.